Born in Glasgow, Scotland, Hamish Stuart shot to fame in the 1970’s as the falsetto voice of The Average White Band, his distinctive songwriting and guitar style paving the way for the band’s worldwide success. When the AWB split in 1982, Hamish went on to tour and record with an array of soul stars including Diana Ross, Aretha Franklin, George Benson and Chaka Khan, for whom he wrote the No.1 chart hit Whatcha Gonna Do For Me? In 1986 David Sanborn invited Stuart to record with him and they released the live album Straight From The Heart on which Hamish sang Al Green’s Love and Happiness–now a Hamish Stuart Band standard. The following year he was back in the studio teaming up with former band member and drummer Steve Ferrone and together they recorded the Easy Pieces album. In 1988 Paul McCartney asked Hamish to join his band and he went on to tour and record with the legendary Beatle for six years, recording 2 studio and 3 live albums in the process before embarking on his solo project. Since leaving McCartney’s band, Stuart has been working on new material of his own with his newly formed group The Hamish Stuart Band. He still finds time to work on projects such as Quincy Jones’ 64th birthday celebration event in Switzerland last year and most recently accepting Bonnie Raitt’s invitation to duet with her on-stage at her end of tour show in London. Sooner or Later, Stuart’s first Compass release, showcases his inimitable vocal style and reflects both his own personality and immensely diverse interests and influences. There are haunting, romantic ballads like Care For You and Same Old Moon included among taut, sophisticated slices of urban funk like It Is What It Is and Midnight Rush. 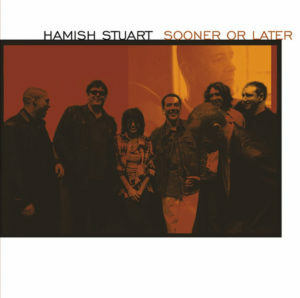 In recent months, the Hamish Stuart Band has blown the roof off of U.K. venues including Ronnie Scotts in London. With the talents of Ian Thomas on drums, Steve Pearce on bass and Jody Linscott on percussion, the band generates a truly ferocious groove. Although it is becoming impossible to book a seat at their monthly gig at the 606 Club in Chelsea, England, fans old and new are always guaranteed a good time and often a bonus from guest friends such as Bonnie Raitt, Brian Auger, former AWB saxophonist Jim Mullen and Molly Duncan. Nostalgia is not the main goal of the shows. It’s hearing a new and soulful band firing on all six cylinders.